Carly Rae Jepsen’s third album E•MO•TION was one of the best of albums of 2015. You already know my feelings on it, and it’s been repeated by plenty of other critics and year-end lists. So it was a disappointment that the album failed the way it did with underperforming sales and brilliant singles that went absolutely nowhere. Even though E•MO•TION was an accessible, joyous pop album full of songs that would be perfectly at home on Top 40 radio, none of them really caught on, and certainly not to the extent of her 2012 smash “Call Me Maybe”. There were some highlights aside from the critical adulation: E•MO•TION did become big in Japan, as a lot of cult records do, and her Gimmie Love Tour got an excellent reception in America. It was also wonderful to see a sea of people sing along to her songs at the Pitchfork Music Festival. However, she’s also done some post E•MO•TION work that seems considerably beneath her, like doing gibberish versions of her perfect pop songs for The Sims and being reduced to an opening act in her native Canada. At the very least, it seems like Carly Rae Jepsen has finally moved away from the shadow of “Call Me Maybe” to become a cult indie-pop singer like Robyn or Grimes or Charli XCX, artists whose fans rightly bemoan their lack of pop success. Even after all that, It’s a pleasant surprise that something like E•MO•TION Side B has been released. The EP, a collection of outtakes from the E•MO•TION sessions, is a well-crafted thank you letter by Jepsen to her diehard fans. Fans have been aware for some time that more E•MO•TION cuts exist aside from than the 17 present on the album’s deluxe edition: Jepsen said that she wrote 250 songs for the album, and whittled the track list down from 40 prospective songs. The eight songs that made it onto E•MO•TION Side B don’t feel like they were indiscriminately chosen. Instead, they share musical similarities, including some that weren’t present on the album. Opener “First Time” is a giddy blast of day-glo synthpop with lyrics on restarting a relationship that are both wistful and forward thinking. The song is highlighted by Carly’s gleeful vocals and the zooming synths that surround her..Like much of Side B, “First Time” has strong influences from the late 80s freestyle genre of dance music. “Higher” and “Body Language” also contain influences from the genre, giving the EP a bright, angular feel for much of its runtime. One of the outliers to the EP’s overall sound is “Cry”, the best song on the package and one of the best from the entire E•MO•TION sessions as a whole. The song is a moody mid-tempo ballad with brilliant, well constructed lyrics about an emotional distant partner that rank as some of the best Jepsen has ever written. The song’s hazy, driving instrumentation recalls italo disco – both the original 80s genre and its revived American form from the late 2000s. “Cry” is one of the best songs of 2016 so far, an immediate winner that acts as the EP’s undisputed centerpiece. Despite the quality of “Cry”, it’s ambiguous as to whether leaving“Cry” off of E•MO•TION was a mistake. It winding up on E•MO•TION Side B means that it has more time and space to shine as the gem that it is, whereas it may have been lost in the shuffle of 17 other fantastic songs on the full record. Although not to the same extent, you could say similar things about other tracks here, like the slow-burning “Fever”, another ballad that lyrically and musically invokes the feeling of a late night alone. The song is another lyrical winner for Jepsen and her co-writers, as the story of bruised, one-sided feelings after a tumultuous breakup unfolds throughout its run-time. The pre-chorus couplet “So I stole your bike/and I rode all night”, in particular, is a winner. “Fever” and the aforementioned “First Time” are the only two songs on the EP to have been previously released, having appeared as exclusive tracks on the Japanese remix album E•MO•TION Remixed+ earlier this year. It’s great to see these two excellent songs receive an international release and be rescued from potential obscurity. On “Store”, the rubbery new wave chorus is coupled with moody verses and a building pre-chorus. The lyrics are quite fun, too: Illustrating the abrupt end of a relationship with that old chestnut of claiming to “go to the store” and leaving for good. 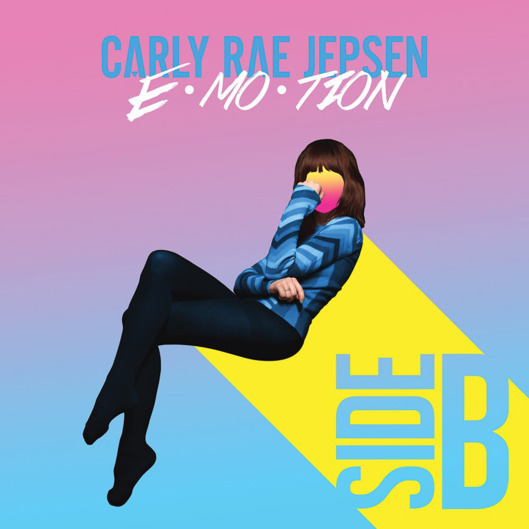 E•MO•TION Side B is proof that everything Carly Rae Jepsen touches turns to gold, regardless of its chart success. That these songs on the EP are just as great as the songs that made it onto the full album is a testament to her extraordinary talents. For the second consecutive year, Jepsen has released a winning, fun, brilliant collection of pop music that deserves to take the world by storm. Side B is easily one of the best releases of 2016 so far and a perfect companion to E•MO•TION. Next ArticleAlbum Review: Britney Spears - "Glory"